Soak the wooden toothpicks in some water for at least 30 minutes before putting in the oven so they don’t burn. Preheat oven to 400 degrees and line baking sheet with nonstick aluminum foil or parchment paper. Carefully slice the jalapeño peppers lengthwise and remove the seeds and white membranes. Remember to wash your hands after touching the peppers! In a small bowl, mix the softened cream cheese, garlic and shredded cheese. Spoon the cream cheese mixture into the jalapeño halves. Cut each slice of No Name Bacon in half and wrap each half slice of bacon around each cheese-stuffed pepper. Secure the bacon to the pepper using the toothpicks. 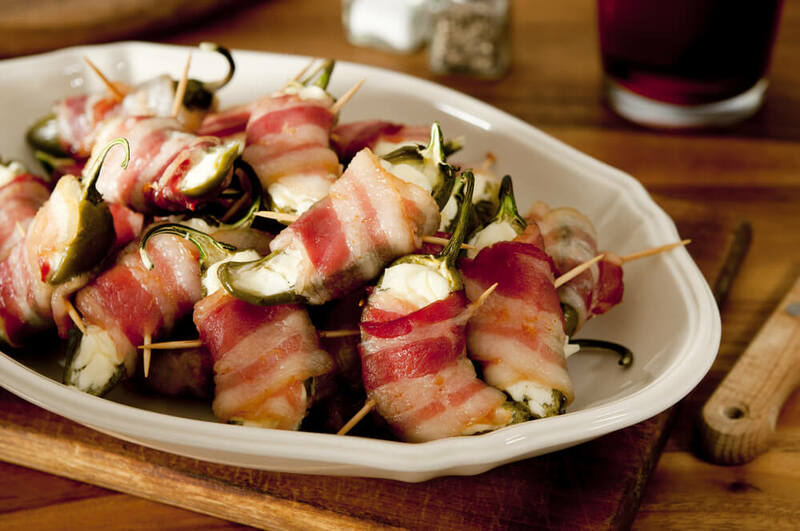 Place the poppers onto the baking sheet and bake for 20-25 minutes until the bacon is crisped and the cheese is melted.